Quick View of ASP.NET MVC5? ASP.NET is very popular framework for developing Web Based Application. ASP.NET MVC is based on Model – View – Controller pattern that makes it more robust, fast, and secure. ASP.NET MVC5 is the next generation technology and it is the successor of ASP.NET Webforms. There are many benefits of MVC over traditional asp.net .aspx web forms. 1. It is based on Model View Controller Pattern. 2. It is lightweight, fast and secure. 3. Designs are Codes are neatly separated. 5. It uses controller based url. 6. Implement no view state. 7. It uses Razor Syntax for customization. 8. It uses Layout at the place of Master page for consistent looks and feel. 9. ASP.NET MVC is open source. Currently, MVC5 is being used and it is the successor of MVC1, MVC2, MVC3 and MVC4. MVC1 was released on March 2009 and since then we have seen 5 major release of ASP.NET MVC. I will not discuss in details about the history of ASP.NET because my motive is to give you direct material for developing real-world ASP.NET MVC Project. 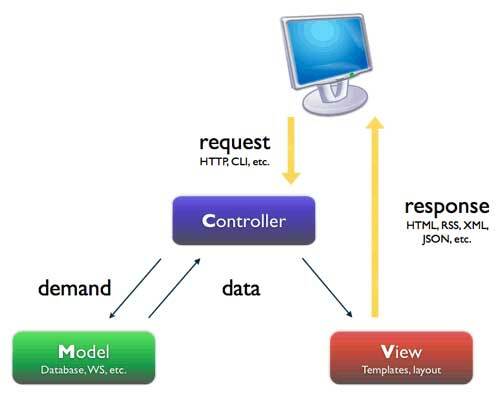 Simply, MVC is short form of Model, View and Controller. Let’s see what the meaning of Model, View and Controller is. Model: It is responsible for keeping database operational logic like connecting and retrieving information from database. View: It is responsible for serving web page user interface to client. MVC works in 3 steps. Step 1: User hits the button on page or make a request through View Page. Step 2: Hits comes to controller. Step 3: Depending on the user request, the controller creates object of the model. Then model comes in action and retrieve information from database. Step 4: After that, this data filled model, passed to View page to server the user. This chapter keeps short introduction of ASP.NET MVC5 including Features and History of MVC. You also learned How MVC pattern works. I have kept this chapter short and summarize to deliver only essential information to you. In the next few chapters, you will learn all about ASP.NET MVC. The next chapter is about installing Visual Studio 2017 or 2015 and MS SQL SERVER on your machine.